When I was doing my first research on Old School gaming, the term Lair appeared sporadically and I didn’t even bother to check it out. I mean, as a non-game term it denotes a place in which something lives and it’s usually nasty. Boring, isn’t it? My first association was a cave with one creature inside. And in my imagination it wasn’t even a dragon (during my entire dm/gm/referee career I’ve used a dragon only once, in my first game. It was a white wyrmling, and it was slaughtered immediately)! So I ditched that concept altogether and read more on Dungeons, Megadungeons, Modules, Wilderness etc. And basically everything else that a person can throw into a sandbox, excluding only Lairs. A text that I’ve recently read proves that I was a fool by throwing Lairs away. Before further reading I recommend taking a look on the linked article (it’s the last in a series of three, but it has the most meat on it). Ok, so once You’ve read that, I can continue with praising Lairs. Why do I find them appealing? Using the template from the article, they are fairly easy to create. You create a theme, some rooms (2 to 5) with creatures (monsters, constructs, bandits, whatever You like, actually) that fit that theme, a short backstory, a couple of rumors that the players will hear, and You’re done. Oh, wait. You can always make a map, and doing so is quite advisable, unless You not only have eidetic memory, but are also able to draw a map in Your imagination. The last part is to put it in Your sandbox. This is so easy that You can make a whole batch of different Lairs at once, place them in different places in the world and wait until Your players stumble upon them. And then look what those witty little creatures will do. In my case it depends on the ‘set of players’ that I’m working with. Some would explore each and every lair. Some would slay everything inside. Some would try to parlay with creatures that possess reason, tame the beasts, try to find a way to control the constructs and make the best looking lair their base of operations. Some would visit only the lairs that they had found amusing. Another advantage is that Lairs are a very good rest from other sandbox stuff. From exploring a dungeon that will take several generations of PCs to even get the idea of its extent of (and from what we learn from Gygax, there should always be some unexplored levels), checking the modules and taking parts from the adventures therein. Lairs are concise, small, and plainly fun. To sum up, I’m glad that I’ve stumbled upon the article and revised my opinion on Lairs. I think that my players will see some quite soon. Very interesting, because I was designing random lair yesterday with Old School Encounter Reference. I think there are two ways of apporaching these thing, surface sandbox and detailed sandbox. Wilderlands of High Fantasy has tables that make very simple lairs that don't include explorations, there are just place with encounters I think. But 5 rooms lairs doesn't give meaningful exploration either, so it isn't a big difference. That is I chose one-room lairs for now. But examples in this article are interesting and maybe I will reconsider that. Not to say I don't use minidungeons in my sandbox because I do, but these are for Ruins (similiar but different category) and small adventures. Though ruins can be done in minimalist way too. Just roll some interesting details and it isn't that boring. What monsters? Let's say it were hills area, so roll on Hills table. Enchanted. Cockatrice. So it's tribesman village that appears completely ruined, but in reality a cockatrice chased people away, made an illusion, and hoarded there some treasure. Okay, this book is rather clunky, with Wilderlands or other it would be more compact, but still it works. It seems that I haven't been thorough in searching for free gaming materials, as I this is the first time I see the Old School Encountere Reference by Kellri. But from what I've seen there thus far it's really good and I'll be certainly using that. As for surface sandbox and detailed sandbox, I would rather say true sandbox and semi-sandbox. A true sandbox is when everything is being generated and is a surprise even for the referee. A semi-sandbox is when some of the stuff is created before, just because the referee wants a particular thing to be there. Of course the players still don't have to visit the places created for that purpose and run only for those generated parts or modules incorporated in the structure of the sandbox. At least this is how I see it, and those are terms that I've coined for myself, as from what I know, officialy both are just sandboxes. And lairs that have a couple of rooms can be interesting because of the thematic encounters. I really like the example of the dwarven artificer, whose home (and tomb) is now filled with sentient weapons and golems. So the generic term Lair can actually describe a minidungeon or just a set of a handful of encounters. I'm not sure if sandbox, as defined by Judges Guild, was supposed to be generated during play, it is not efficent because you haven't got much time to make quality interpretations of dice rolls for ruins, etc. 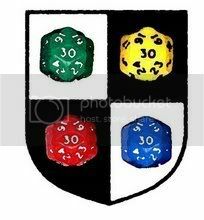 What is fine to roll during game sessions are miscellaneous encounters, especially in cities. I suggest you disable captcha, some people would rather not post at all than to struggle with it. By generated I didn't mean that every roll has to be made during play. It's rather that everything (or almost everything) get generated in general. So, the things that need to be generated before play (like the things that You've mentioned) get their rolls, but You don't put too many things on purpose, maybe aside from some towns. Miscellaneous encounters of course should or even have to be rolled as they provide many interesting opportunities for both the referee and the players. Ok, I've got rid not only of captcha, but also of the necessity to be registered. If too many spambots will write commentaries I'll put back the necessity to log in. But frankly speaking I doubt that I'll have much more commentaries that way, at least for now, as the blog doesn't contain too much content at the moment.